UNIQUE HOLIDAY GIFT - For parents of school children for when their child opens their Star Wars, Hello Kitty or Disney Frozen lunchboxes they will find a special note from them. CUSTOMIZABLE - Some cards are patterned but blank in the middle for a hand written note from mom or dad to your special boy or girl. You can also write on the back. Printed on card stack for that purpose. 52 TOTAL CARDS - will help you brighten your student's day before the major Holidays in their lunch box or bag with a special note. At 2x3 inches, they're small and compact to fit in lunchboxes or lunch bags or whatever lunch container your kid uses. 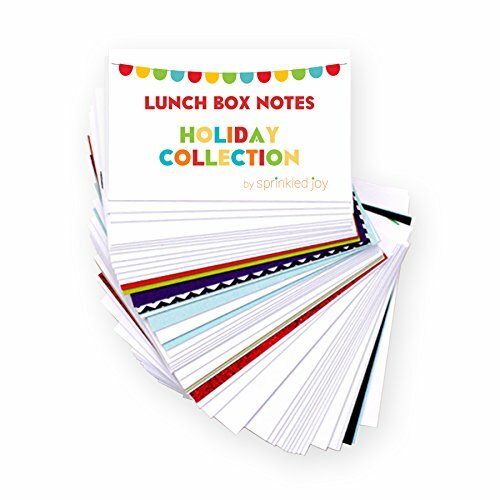 CARD STOCK - It is made of thick card stock paper so make sure that if you have a cooler, insulated for hot or cold food, lunch bag or tin lunchbox that you seal up your bags because the paper will stain. Designer Lunch box notes to brighten or encourage your child on their lunchbreak with different sayings and some customizable cards as well. We includesome designer blanks notes so you can customize the note to a specific day orevent. Scroll back up and hit the add to cart button.